It rightly faces the Harmandir Sahib. Built by the Sixth Master Guru Hargobind (1606-44) in 1609, has been the nerve centre or the Sikhism ever since. All commandments affecting the community as a whole were and are issued from here. 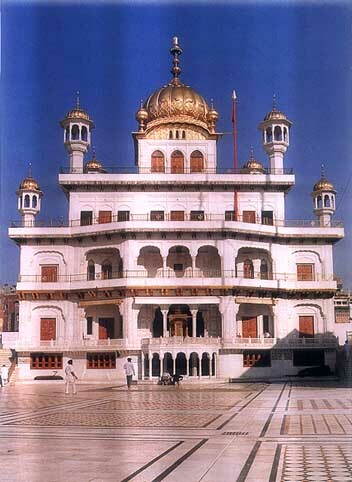 The Akal Takhat was used for holding court and Sikh congregations in the days of its builder. A Sikh temple without a Community Kitchen is inconceivable. Cooked food is serviced in the kitchen of the Harmandir Sahib 24 hours to all visitors irrespective of religion, caste, creed and nationality. The expenses are met out of the Temple funds. Approximately 40,000 visitors share the meals everyday presently. There are 66 Rooms in Guru Nanak Niwas-22 with attached baths and 4-4 without baths, but on each floor there are 10 bath rooms and fen flush latrines so as to make stay comfortable. There is Akal Rest House having 26 rooms with double beds and attached bath rooms are provided on a nominal Rent. There are 92 double bed rooms with attached bath in addition to four halls. Rooms are available at Rs. 50/- per day. An accomodation adjacent to Guru Nanak Niwas with 1 00 rooms coming up. The headquarters of the Shiromani Gurdwara Parbandhak Committee are located in the Teja Singh Samundri Hall near the Harmandir Sahib. The Gurdwara Act 1925, transferred the control of the historical Sikh Shrines in the Punjab to the SGPC. It is a representative body of the Sikhs elected by adult franchise. (f) Gurdwara Shaheed Bunga Baba Deep Singh. (a) GOLDEN DOOR PANELS - There are four pairs of them. (b) GOLDEN CANOPY - The canopy studded with precious jewels, is an object of exquisite workmanship and great artisitic value. (c) JEWELLED HEAD-BAND- It is a gift from Maharaja Ranjit Singh. It was prepared for the marriage of the son of Maharaja Ranjit Singh, at the time of marriage. The Maharaja presented it to the Harmandir Sahib. Central Sikh Museum has paintings of Sikh Gurus, Saints, Sikh warriors and other prominent Sikh leaders who have in their own way contributed a lot to the enhancement of Sikh Religion.